For many, many years you've basically had 2 choices for your Overdrive/Distortion pedals: You could either get "Soft-clipped" Bluesy, slightly compressed, (Toob Screemer, FD2, etc.) type Overdrive pedals... or you could get "Hard-Clipped" (OCD, Distortion+, Boss DS-1, etc.) type Distortion pedals. What if there was a pedal that offered both? There is now... the Fulltone PlimSoul with it's Patented (US Patent#8471136) and completely unique dual stage clipping circuit which VERY accurately replicates not only the sound, but *the feel *of a tube amp with all of its subtleties and complexities. 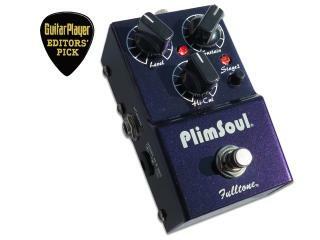 PlimSoul has those Softer Bluesey, Compressed capabilities but also has a Second Stage that you can roll in with the turn of a little dial to add that firmer, crunchier, British output tube style Distortion! What's more is you not only hear and feel it... you can SEE the pedal reacting to your every mood via a firey LED that glows brighter and dimmer depending on how distorted it is and how hard you're hitting it. Touch sensitive? Doesn't get any better. Clean up with the guitar's volume control? More than any, yes, even more than the OCD. Speaking of OCD, people ask "What's the comparison?" Easy answer: OCD has an honest flat EQ, won't change your amp's tone. PlimSoul has a gorgeous enhanced Midrange and Lower midrange... excellent to transform a combo into a Marshall-like lead machine, not so necessary if you already have a Marshall-like amp. I use PlimSoul on any combo, I use my OCD on both combos and larger Marshall-style amps/cabinets. Good with Humbuckers as well as Single coils? Yep. Does it play nice with other pedals? Yes, it has an Ideal 500K Input Impedance, ideal super low 10K output impedance. For some demos, here's a great Plimsoul demo video from Andy Baylor. And check out the great MusicToyz demos in the Fulltone video gallery. "Yeah man, this PlimSoul is one of the most musical high gain pedals I've ever heard..."
Michael Landau tracking with PlimSoul all over his latest project! The PlimSoul gets Guitar Player Magazine "Editor's Pick" award! Looks like the people at Guitar Player Magazine know a good thing when they see (and hear) it.